Christmas is getting closer! Who has their shopping done? lol Not me! I have so much to do but also so much fun doing it! I loved it when the kids were all small and they snuck around trying to guess the presents under the tree. They would shake or peel a bit of paper off the packages trying so hard to be quiet. I saw the newest images below and knew this card had to be made in remembrance of those days before Christmas. Our new Challenge at Midweek Magnolias is ANYTHING FESTIVE. Many occasions in our lives are festive and my favorite is Christmas!! 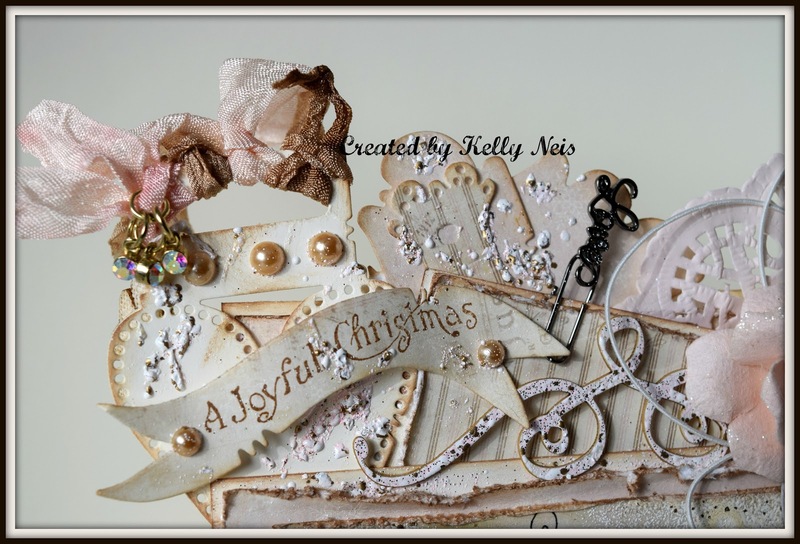 The combination of images on my card are my favorites in this Magnolia collection A Lovely Christmas. 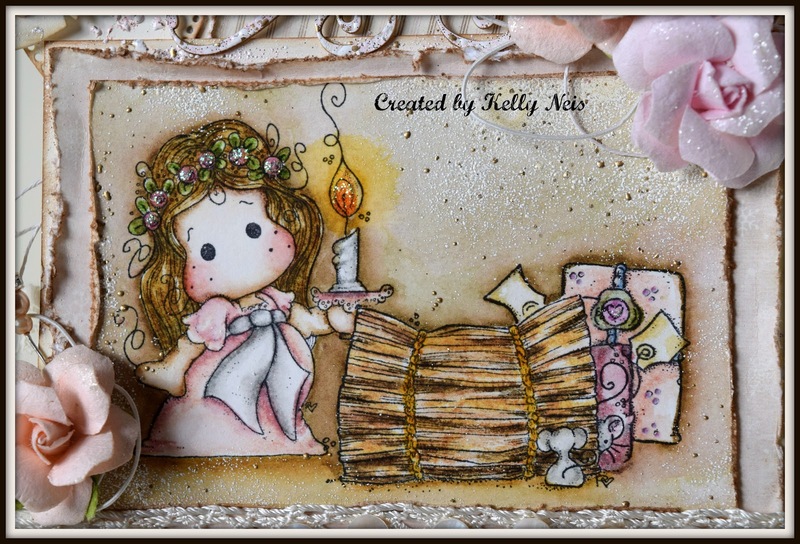 I used luscious Pion papers and distressed inks to create my card. Layers of distressed paper and of course Frontage, cannot live without it. Some awesome Magnolia Doohickeys to make it more festive. Some florals and doily. My clip (love) is new from Prima, they are so cute. Thank you for visiting me today, I love your visits. 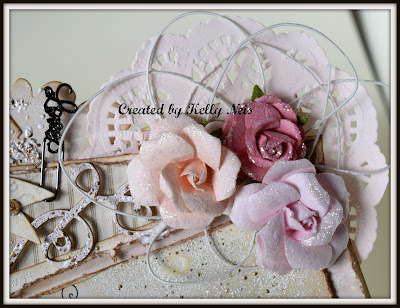 Please stop by the other Design Team members blogs and be inspired. 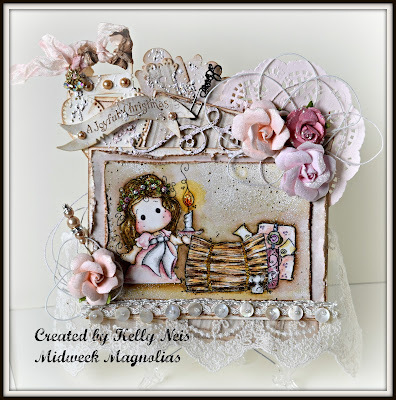 Our Festive Challenge at Midweek Magnolias is a great way to try and win a prize using all those gorgeous Magnolia cards. Hope to see you there. Oh Kelly this is simply gorgeous!! I love all your wonderful embellies and of course Tilda is the star...I love the bale of straw...I'm waiting for an opportunity to ink up mine! Have a most wonderful day Kelly! This is just too sweet, Kelly. I love how you colored Tilda and the gorgeous design. I am sending Happy Holiday wishes to you and your family. I pray the Lord looks down on you with blessings every day. Hello Kelly! 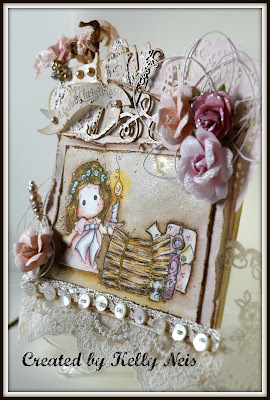 Wow wow wow... how elegant is your card, I just love how you created a story with your images. Very pretty! Hugs. STUNNING card Kelly! So precious! Love, love, love it! It's very special! Thank you so much for sharing your great talent with us at Marvelous Magnolia! Absolutely stunning - I love the delicate pink blush and all the sparkly textures. Such a sweet image too, beautifully coloured of course, with that warm glow from the candle flame. 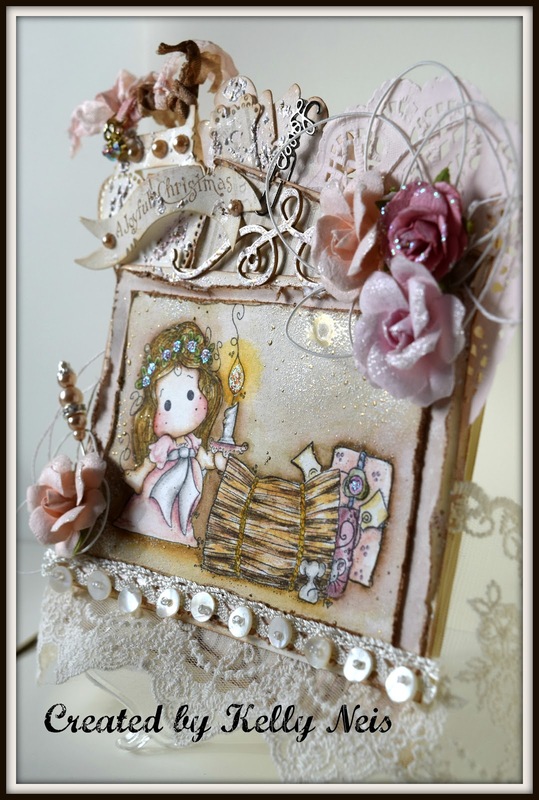 A lovely card with such nice details.....lovely flowers and sparkles.....Beautiful!